Implementation of electric car fast charging took a step forward with Tuesday's announcement by ABB of the Terra Smart Connect Duo, the first 22 kW AC & DC fast charging station, supporting a 30-120 minute recharge time for compatible electric cars. The new station supports the CHADEMO standard available on the Nissan Leaf, Nissan E-NV200, Mitsubishi Outlander, Mitsubishi i-MiEV, Citroen Berlingo and Peugeot Partner, as well as a new AC standard supported by the Renault ZOE and the newest Smart fortwo Electric Drive. While ABB has announced support of the new SAE DC Fast Charging station, support for that standard is not part of the Terra Smart Connect Duo. The technology world often ends up with Betamax-versus-VHS style standards battles where ultimately the consumer is the loser, and those of us who owned Beta VCR's back in the day know what this means. In electric car charging the main battle has been between the CHADEMO proponents and the SAE J1772 committee members. The CHADEMO proponents are primarily Nissan and Mitsubishi, while the SAE DC Fast Charging proponents are a consortium of 8 German and American automakers working together in the SAE J1772 committee. These two protocols are incompatible. Renault recently introduced a new variant of fast charging with the Renault ZOE and it's support for fast charging on 43 kilowatt three phase AC, and Daimler recently showed a new Smart fortwo Electric Drive supporting the same AC Fast Charge system. There is, of course, the Tesla Supercharger for the Model S and X that will completely recharge the Model S in under an hour. That makes three DC fast charging systems, and one using three phase AC, all of which support half hour recharging time but using different mechanisms. ABB's new charging station is a step towards harmony in fast charging protocols, demonstrating that the fast charging standards battle can be fought among automakers without hurting the consumers who buy electric cars. By implementing both the three phase AC and CHADEMO systems it demonstrates that fast charging stations can support multiple charging standards. ABB has also shown a functional prototype of the SAE DC Fast Charging system, and presumably will incorporate that standard into the Terra Smart Connect line when the time is ripe. In the due course of time it is expected some of these fast charging protocols will fall out of favor, by losing the standards battle. When Beta lost to VHS it meant Beta VCR owners were no longer able to find videos to rent at the video store. ABB's new Smart Connect Duo charging station means that electric car owners are less likely to suffer a similar fate, because it supports multiple electric car fast charging protocols. The Terra Smart Connect Duo is meant for indoor or outdoor installation and requires a 400 volt three phase AC 32 amp circuit. The DC output supports a 20 kilowatt charge rate at up to 50 amps and voltages between 180-500 volts, using the CHADEMO standard. The AC output supports a 400 volt three phase AC 32 amp output, using the EN 61851-1:2010 standard. The stations support the Open Charge Point Protocol for authorization, remote start/stop and other remote monitoring and management features. ABB operates a "service cloud" enabling Terra Smart Connect Duo owners to remotely manage their charging stations. Seamless integration with payment & billing platforms mean easy and secure payments via a smart phone, parking management terminals, RFID cards or pin code access. 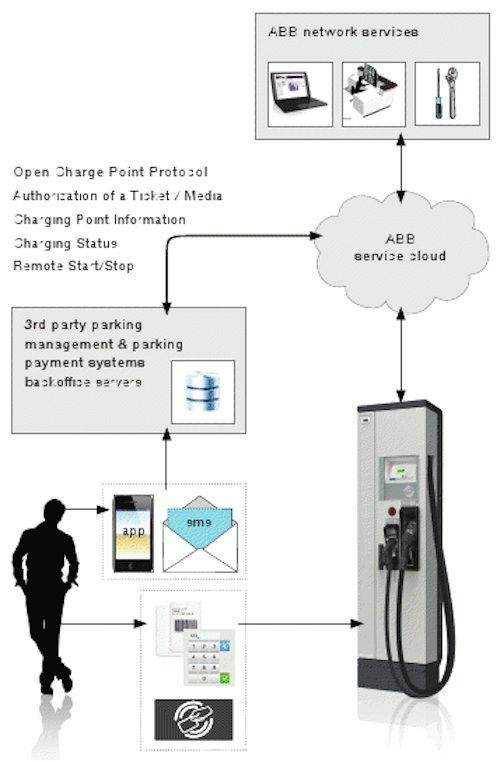 A charging station network operator would integrate their preferred payment system with Terra Smart Connect Duo's deployed in the field, and manage those stations using the ABB service cloud. ABB has already made large deployments of fast charging stations in Estonia and Belgium, and is one of the major global providers of electrical supply equipment. Their products normally sit in the basement in power distribution rooms. The company's charging stations are a departure into customer-facing products. Towards the end of 2019, ABB estimates that the market for charging infrastructure solutions will reach $1 billion. For what market is this fast charger AC/DC ? Only Europe?